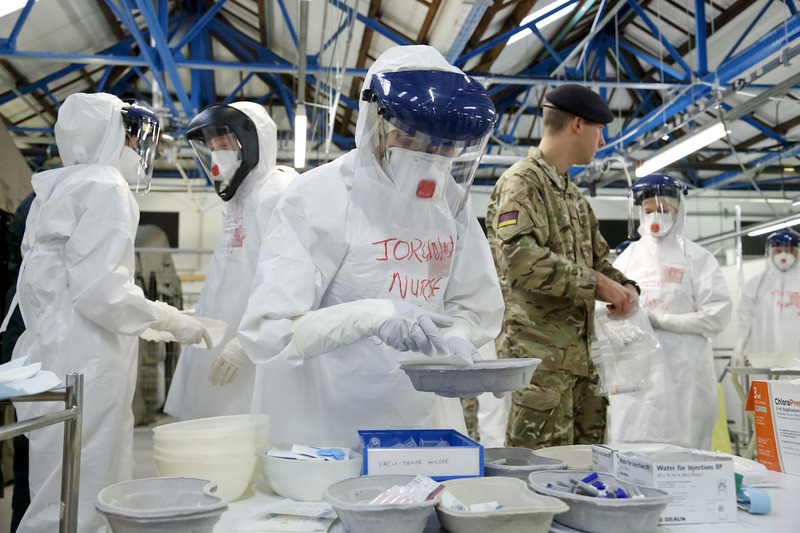 Simulation played a vital role in helping the British Army’s 22 Field Hospital prepare for caring for health workers infected with the deadly Ebola virus. SImulation (live or virtual) is essential in terms of helping the military refine and rehearse accepted tactics, techniques and procedures (TTPs) before they deploy on a mission or tactical operation. In most cases, military doctrine and TTPs are well-entrenched and understood by military personnel before they enter a training environment. But in 2014 when more than 100 members of the British Army’s 22 Field Hospital found out they would deploy to Sierra Leone to work in a treatment facility for local and international healthcare workers that may have contracted the Ebola virus, there were no well-rehearsed military doctrines or TTPs in place. “We created the world’s best trauma hospital in the desert of Afghanistan with a 98.6% survival rate, but we were completely untested in a deployed hospital to care for infectious diseases and there was nothing out there to show us how to do it,” explains Lieutenant Colonel Chris Gibson, chief instructor, Army Medical Services Training Centre. Defence Procurement International spoke with Lieutenant Colonel Gibson during the Defence & Security Equipment International (DSEI) conference and exhibition in London last September. He was charged with training personnel to work within a completely new health environment and he had just four weeks to do it in. Lieutenant Colonel Gibson says the Army’s methodology was to go in and provide health care workers with the succour that if they did become infected they would receive first-world care. Greater resilience within the health care system in Sierra Leone was needed to ensure medical personnel did not stay away from the hospitals, which were struggling under the sheer weight of Ebola cases. The 12-bed treatment centre (which later increased to 20 beds) staffed by 22 Field Hospital in Sierra Leone was also there to ensure NGOs that there was a capability that would look after them if they contracted the virus. Although there had been 18 previous Ebola outbreaks in Africa, Lieutenant Colonel Gibson says the one that swept through West Africa in 2014 was larger than all of the 18 combined. He was in Sierra Leone five years prior to the 2014 outbreak and had been in Kikwit in the Democratic Republic of Congo in 1995 when there was a previous Ebola outbreak. So he understood the virus and what it could do to a community. 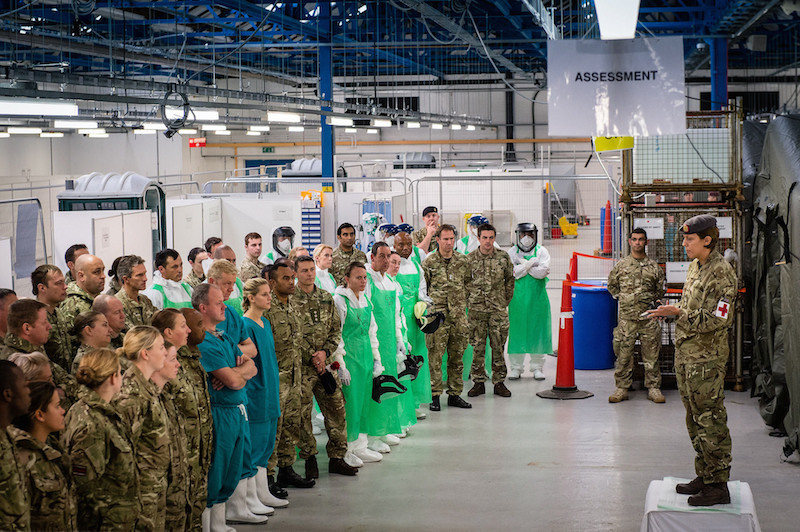 To give 22 Field Hospital and other army medical personnel the confidence to know they could go out to Sierra Leone and successfully treat people with Ebola, a mission training facility was established at the Army Medical Services Training Centre (AMSTC) in Strensall, York. A hangar was converted into a mock-up field hospital where simulated casualties were treated to replicate the situation they would find when they deployed to Sierra Leone. The training was designed to develop and assess the clinical and organisational procedures required, including the ‘donning’ and ‘doffing’ of personal protective equipment (PPE). As there were no well-established operating procedures already in place, to better understand where the contamination of local and international healthcare workers was occurring, Gibson referred to information provided by military doctors that were embedded with NGOs and then videoed all training conducted in York to gain deeper granularity. The British Army worked closely with Trauma FX, a provider of realistic casualty simulations. The simulations enabled medical staff to rehearse clinical treatments and their PPE procedures in a realistic and controlled environment. Training aids saw medical personnel take ‘simulated bloods’ that contained specialist trace materials from Ebola-patient role players. Trauma FX provided realistic Simbodies (life-like bodies) and simulated make-up effects, including simulated vomit and bodily fluids. “So that’s what I gave to the chain of command. Straightaway you built up a level of confidence that we could go in there and not die. It was a great use of soft power.” According to the World Health Organisation’s February 2016 Ebola Situation Report, the outbreak in West Africa was declared to have ended in Sierra Leone on 7 November 2015. Isolated cases continue to be reported, but nowhere near the tens of thousands of cases at the height of the outbreak in 2014. The training provided and experience gained by 22 Field Hospital and other army medical brigades could now prove invaluable in future public health or disease outbreak scenarios where the military is called upon to assist. The UK Ministry of Defence’s 2015 Strategic Defence & Security Review, which sets out the government’s approach to national security, highlighted public health as a Tier One risk over the next five years.